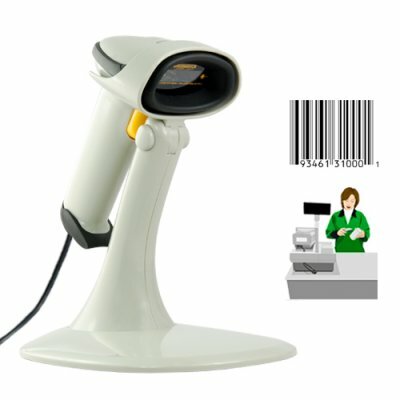 Successfully Added Bar Code Scanner with USB for Businesses to your Shopping Cart. Increase productivity and transform your stock room and warehouse in to an organized dream land with this innovative bar code hand-held scanner. Simply connect the bar code scanner to your PC using the USB cable provided, then scan the appropriate UPC code within the instruction manual provided to set your new bar code scanner. This process takes mere minutes and you'll be able to start using you new barcode scanner right away. Designed with the user in mind and careful ergonomics, this handheld barcode scanner comes especially shaped to be held and operated comfortably. After using the bar code scanner, you don't have to leave it lying on the table, provided with this model G123 is a holder + stand. Bar code systems provide an array of benefits, including operational efficiency, better customer service, and improved visibility of key business information to management. Simplicity, Implementation & Cost Effectiveness: Operators of barcode scanners can learn to use the equipment effectively in less than 20 minutes, and this in turn will reduce system costs for manual labor. Bar code provide the highest level of reliability in a wide variety of data collection applications. Bar code systems create value not only by saving time, but also by preventing costly errors. Information is your most valuable asset, so you need the most reliable data management systems available for your budget. Wrong information in your supply-chain or operations can create unacceptable risks, lost business and higher operating expenses. Protect your organization by ensuring data accuracy and availability. The CVKY-G123 barcode laser scanner is proudly brought to you by the leaders in factory direct wholesale electronics, Chinavasion. What are the advantages to my business of having a barcode reader? Bar code readers eliminate the need for manual entry of inventory data and turnover. It is proven to be very efficient in inventory control as well as shipping and receiving, point of sale and tracking. I have not previously worked with bar code scanners, are they easy to operate? Just like most electronic consumer products, you spend some time in the beginning learning how to operate them, before operating the barcode scanner, make sure you read the user manual included, and you'll be good to go.